Ideal for larger & in-use items. Wide coverage spray pattern. Treats approximately 25 SQ. metres. Fine mist spray. Acts in 15 minutes. For carpets & furnishings. 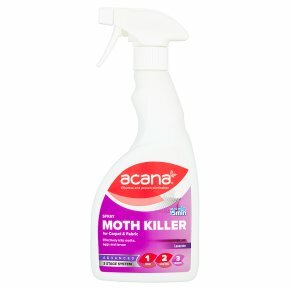 Kill moths, eggs & larvae safely. Complete home protection. Statutory Conditions of Approval Relating to Use: For use only as insecticide. Users must comply in full with the control of pesticides regulation 1986 (as amended), including complying with all condition of approval. One 500ml bottle treats approximately 25 square metres. Use only as described on label. Read all precautions before use. HSE: 10092. To avoid risk to man the environment, comply with instructions for use. Contains: Transfluthrin 0.1% w/w. Piperonyl Butoxide 0.01% w/w. Causes serious eye irritation. Very toxic to aquatic life. Keep out of reach of children. Wash contaminated skin thoroughly after handling. IF IN EYES: Rinse cautiously with water for several minutes. Remove contact lenses, if present and easy to do. Continue rinsing, if eye irritation persists: Get medical advice/attention. Collect spillage. Dispose of contents/container in accordance with national regulations.<br>Contain Reaction mass of: 5-Chloro-2-methyl-4-isothiazolin-3-one (EC no. 220-239-6) (3:1).<br>May produce an allergic reaction.